Looking for those “Continued online” parts? Click Here! Extra link to Check Out (but the blue one on the side is more fun! A new version of SP! Run by Small Press Idol 2009 winner Eric Hendricks in 2010. The SPA group votes to change the name of Obscurity Unlimited, and we reclaim the numbering of all newsletters. Lasts from 2004-2005, until Small Press Idol took over our lives. The original run of SP! was born in a time of small press turmoil, 1989, as the void of Small Press Comics Explosion’s cancellation had a number of publications start up. It went from an 8 page first issue, to a newsprint zine we gave away by the 1,000s at conventions, and faulterd under the course of unplanned moves, marriage, divorce, and just getting too big to carry it’s own weight. 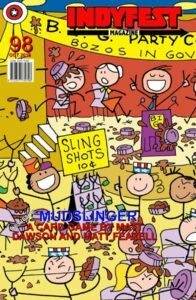 In the FALL 2016 issue: Cover is story -Matt Feazell and Matt Dawson, interviewed about their political game, Mudslinger, by Ian Shires! Additional Interviews with Stephaie C. Lyons-Keeley and Wayne J. Keeley, David Scacchi, and Trisha Sugarek. Sneak Peeks of Earthings #2 by Dave Brink, Jim Jimenez, and Jeremy Scott Brworning, Planet Earth by David Scacchi and Gary Welsh, and Tales of Terror by David Doub, Lou Manna, and Jerry Gonzales. Articles include Doug’s A Written View series, Trisha Sugarek’s Motivational Moments, and the Hall of Fame report by Ian Shires. Top it all off with a 10-reviews review section. Work this issue done by: Ian Shires, Ellen Fleischer, Douglas Owen, Trisha Sugarek, Louise Cochran-Mason, and MJ Moores. Cover artwork by Matt Feazell, a 40 page full color, link enhanced PDF! In the September 2016 issue: Cover is Andrew Snook’s Remy’s Story, interview by Trisha Sugarek! Additional Interviews with E Ardell, Barry Corbett, Gabriel Eziorobo, and j. Francis Parker. Sneak Peeks of Wunderfolk #1 by Alex Barranco, Mohamad Rezk, and DC Alonzo. Raising Dragons by Bryan Davis, Shiloh and James Ville. Articles include Doug’s A Written View series, Trisha Sugarek’s new article series Motivational Moments, Honing your Craft -pt.2 by Nanci Pattenden, and the Hall of Fame report by Ian Shires. Top it all off with a 13-reviews review section. Work this issue done by: Ian Shires, Ellen Fleischer, Douglas Owen, Trisha Sugarek, Louise Cochran-Mason, Nanci Pattenden and Dominici Hawkins. Cover Photography by Krista Maier, Additional artwork and photography in this issue by: Cristine Snook, Kris Brander, Fotografia Boutique, Ampersand Book Covers, Latifah Abdur, 48fourteen Publishing, Llich Henriquez, Britta van den Boom, Marilyn Stow, and PJ Monfero. 44 page full color, link enhanced PDF! In the August 2016 issue: it’s a whole summer in one hot issue, with TWO different versions, each with a different cover feature! 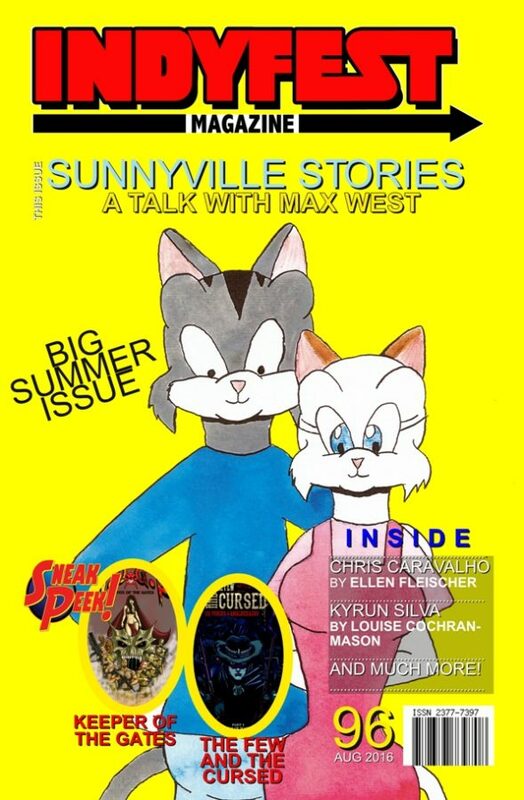 Version A has Max West’s Sunnyville Stories, Version B has Chris Caravalho’s Mana Born. Additional interviews with Kyrun Silva, Michael Saad, and David Nicoll. Sneak Peeks of Keeper of the Gates #1 by Dan Demille and Rodney C. Jacobsen, and The Few and the Cursed #1 by Felipe Cagno and Fabiano Neves. Articles include Doug’s A Written View series, Honing your Craft by new Indyfest writer Nanci Pattenden, Hall of Fame report by Ian Shires and an article by Trisha Sugarek. Top it all off with a 19-reviews review section. In the May 2016 issue: It’s the return of the reviews section! We have a cover story on the Ray, Tim and Rob Podcast, Interview with Raymond Francis, Timothy D. Craggette, and Robert Spencer by Ellen Fleischer. Interview with Melissa Grunow by Trisha Sugarek. 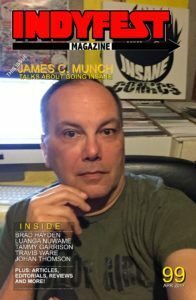 Interview with James Art Ville by Louise Cochran-Mason. Sneak Peek of Perfect Storm #1 by: Rob Jones, Vittorio Garofoli and Ashley Lanni. Douglas Owen continues his A Written View series. Article: Training your Stalkers by MJ Moores. And report on the live Hall of Fame presentation honoring first inductee Tim Corrigan to the SPHOF. 36 page full color, link enhanced PDF! In the April 2016 issue: We start addressing some upcoming changes and additions to the magazine. 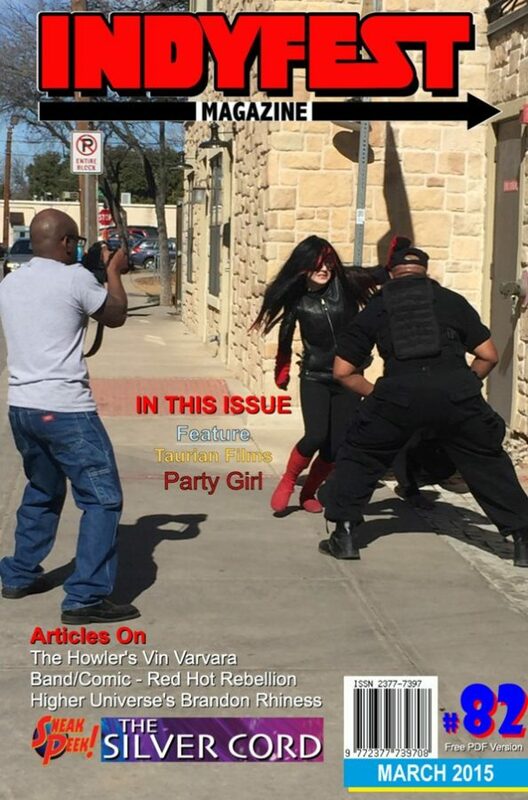 Cover story on DirK Manning, Interview with Troy Vevasis, We introduce our new Music Editor Cristie Hine as she interviews Chris Auerbach-Brown. Sneak Peek features of Caligula Imperatore Insanum -vol 1- by James Kelly, Christie Shinn/HoraTora Studios, and Wind and Fire #1 By Travis Ware, Jose Henrique, Ani Ghosh & Mithun Roy, Christopher Ruiz, JC Fubal & Bryan Magnaye, and Aris Sutanto & Lintang Pratiwi. Douglas Owen continues his A Written View series, and we take a look at MORE Hall of Fame developments. Last but not least, a Reviews and Distribution article. Join the continuing Indyfest Evolutions! Work this issue done by: Ian Shires, Ellen Fleischer, Douglas Owen, Dominichi Hawkins, and Cristie Hine. 32 page full color, link enhanced PDF! In the March 2016 issue: It’s Dimestore’s 30th Birthday, celebrate with us in the pages of the new issue. 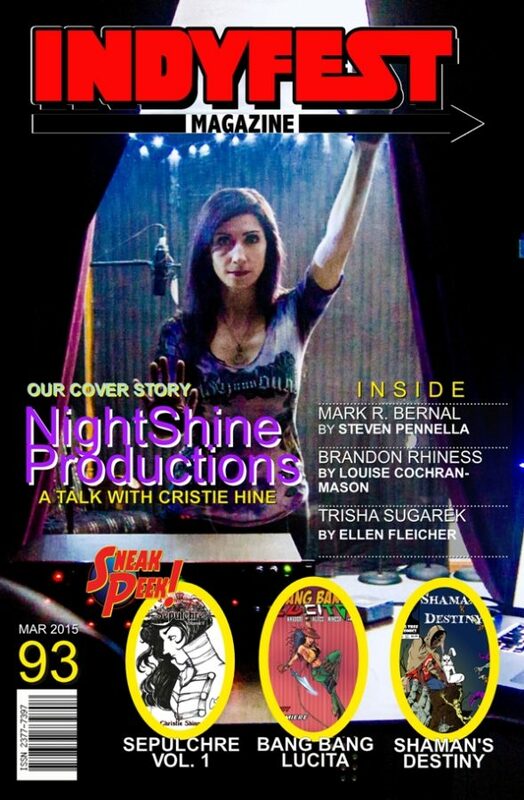 Cover Story on NightShine Productions, a small town indy music studio – Interview with producer/owner Cristie Hine. More interviews with Mark R. Bernal, Brandon Rhiness, and Trisha Sugarek. Sneak Peeks of Sepulchre #1 by Christie Shinn, Bang Bang Lucita #1 by Chuck Amadori, Edson Alves, and Nimesh Morarjie, and Shaman’s Destiny#1, by Kyrun Silva. Douglas Owen continues his A Written View series, and we take a look at Hall of Fame developments. Last but not least, it’s the introduction of the NEW RELEASES section, presenting publications from indy publishers…which we’re thinking about transitioning to a review system. Join the continuing Indyfest Evolutions! Cover Photography by: Nikkia Kostner, Additional artwork in this issue by: Trevis Martinez, Przemyslaw Debelis, Carlos Trigo, Nick O’Gorman, Chris Johnson, Eugene Belivu, Brittini Bromley, David White, and Lori Smaltz. 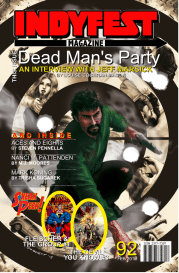 In the February 2016 issue: Dead Man’s Party Interview with Jeff Marsick, Aces and Eights Interview with Frank Mula & Sal Brucculeri, Mystery Writer Nanci M. Pattenden, New perspectives on OZ with Bob Moyer, and Novelist Mark Koning. Sneak Peeks of Fleicher & the Group #1 by Ed Gross, Leon McKenzie, and Fernando Sozo, and The Devil you Know #3 by Frank Mula, Kellik Iskandar, and Nunan Nurjannah. Doug Owen’s A Written View. 40 page full color, link enhanced PDF! 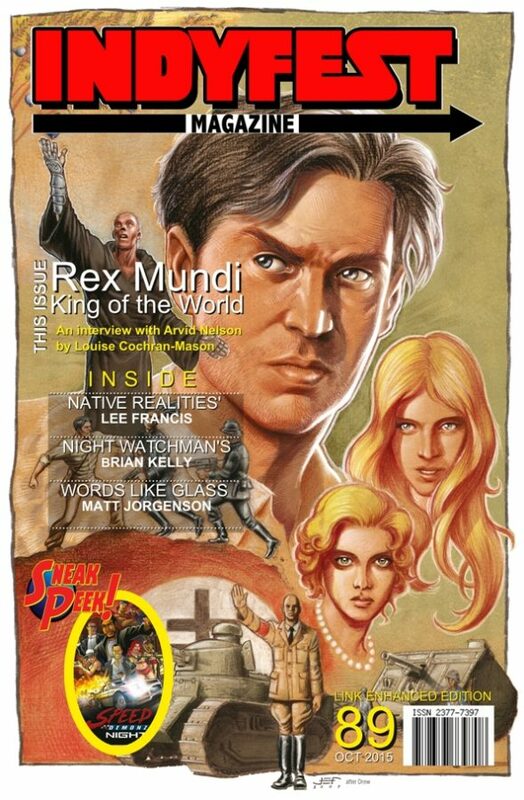 In the December 2015 issue: Charlton Comics – The Movie, interview behind the scenes with Keith Larson and Jackie Zbuska, Also, interviews with Greg Wronchak, Adrian “Asia” Petty, and Chris Wichtendahl. Articles on Finding Inspiration, Killing Your Characters, and Short Story Submissions. Cover Photography by: Jude Breidenbach, Additional artwork and photography in this issue by: Paul Heriot, Rebecca Fedun, Geoffrey Gwin, Sherrie Hunt, Donte K. Hayes, Javier Lugo, Joe Rubinstein, Buddy Prince, Marcel Zero, Florencio Duyar III, Jeff Zugale, Sean Tiffany, Ozzie Rodriguez, Kim Scoulios, and Ariel Lacci. 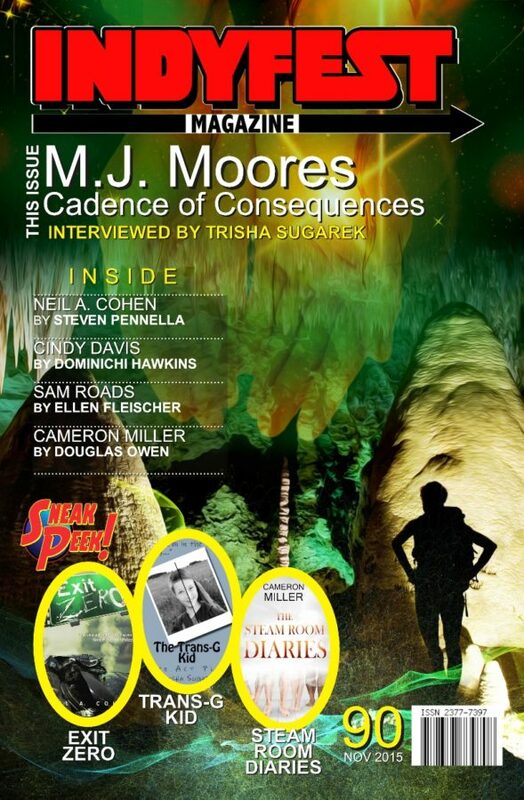 In the November issue: M.J. Moores interview, plus Neil A. Cohen talks Exit Zero with a Sneak Peek as well. 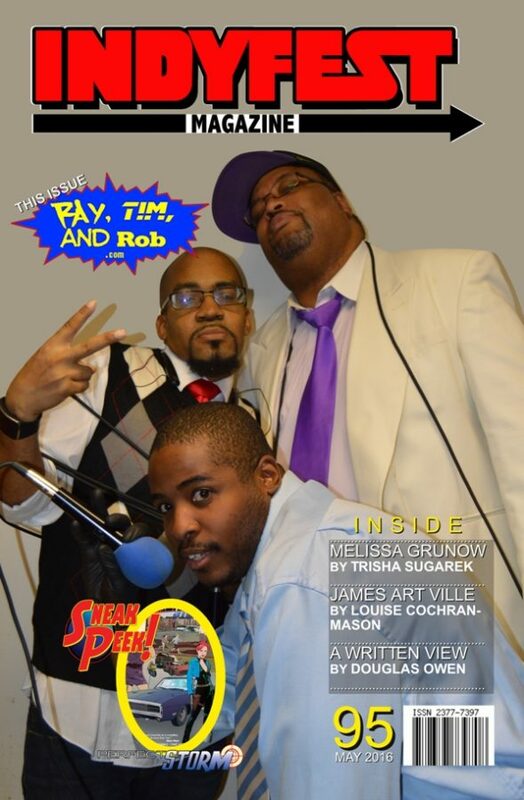 Cindy Davis is The Fiction Doctor, and we interview Sam Roads and Cameron Miller. More Sneak Peeks of Trisha Sugarek’s Trans G Kid, and Miller’s The Steam Room Diaries. Article: Doug Owen‘s A Written View. Work this issue done by: Ian Shires, Ellen Fleischer, Douglas Owen, Trisha Sugarek, Steven Pennella, and Dominichi Hawkins. Cover art by: Rae Monet, Ink. Design. Additional artwork in issue by Alex Sheikman, Kat Nicholson, Jen Carson, Permuted Press, Essel Design, and Champagne Books. In the October issue: Cover story with Arvid Nelson, interviews with Lee Francis, Dave Kelly, and Matt Jorgenson. Sneak Peek of Speed Demonz Night by Gabe Lamberty. Work this issue done by: Ian Shires, Ellen Fleischer, Douglas Owen, Trisha Sugarek, Louise Cochran-Mason, and Raphael Moran. 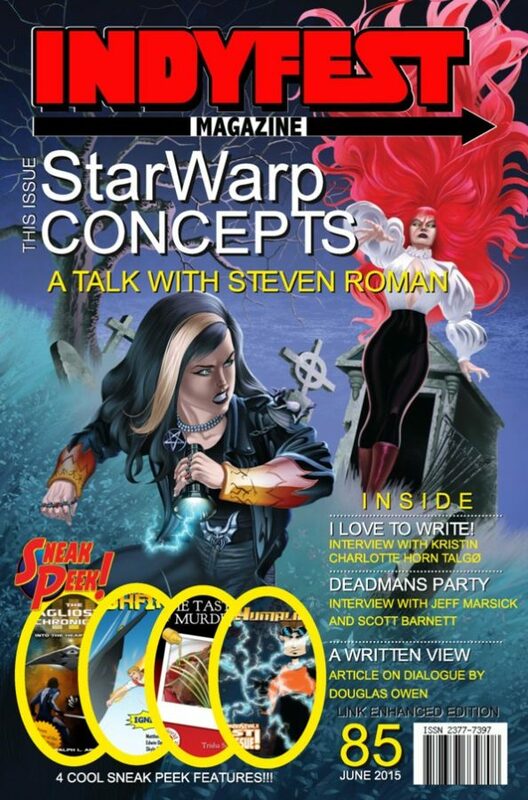 Cover art by: Juan Ferreyra, additional artwork in issue by EricJ Jeromy Cox, Matt Camp, Dave Stewart, Kristina Bad Hand, Arigon Starr, Amanda Scurti, and Lara Antall. Work this issue done by Ian Shires, Ellen Fleischer, Douglas Owen, Dominichi Hawkins, and Trisha Sugarek. 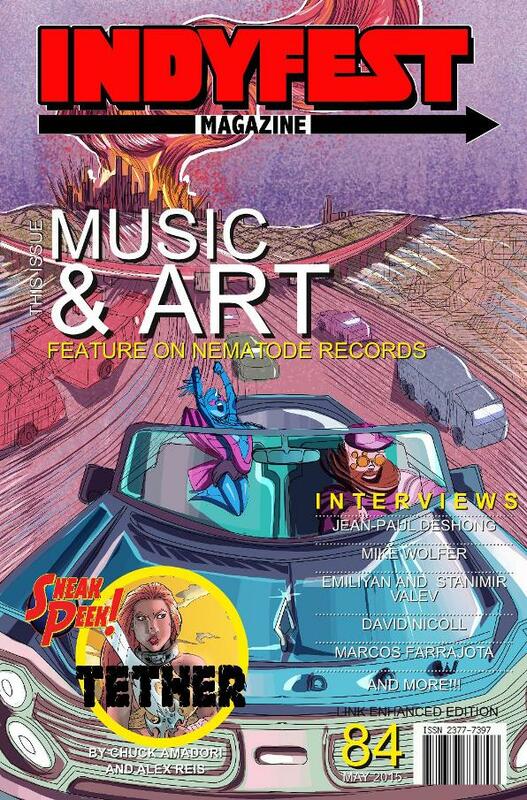 Cover art by: Chris McFann, additional artwork in issue by Quinn Salazar, and Scott Angle. 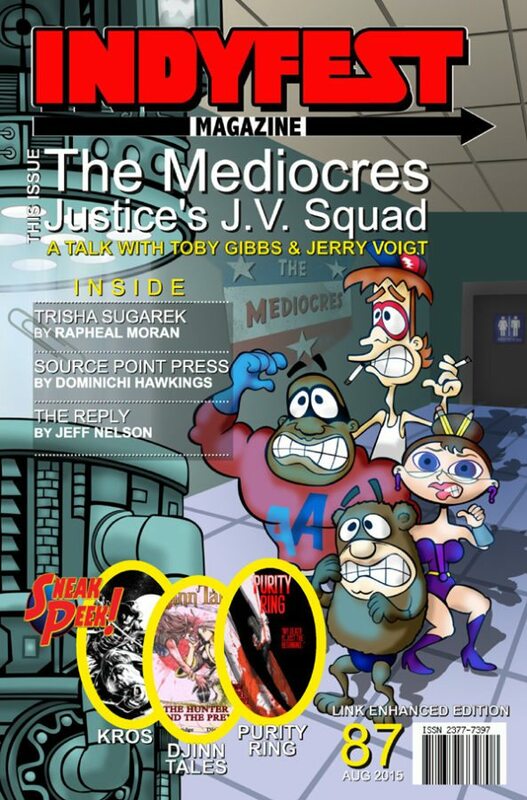 In the August issue: Cover story on The Mediocres creators – Toby Gibbs & Jerry Voigt, Plus Interviews with Trisha Sugarek, Trico Lutkins, and Carly Ottaway. 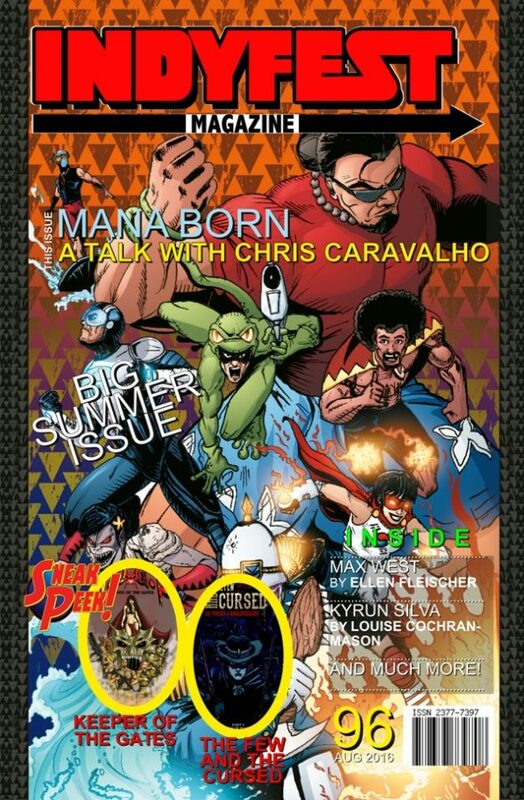 Sneak Peeks of John Ostrander and Tom Mandrake’s Kros, Djinn Tales by Sean Northridge and Diego Vidal, and Purity Ring by John Farman, Rodolfo Ezequiel, Cristian Sauret, and Juan Hernandez. 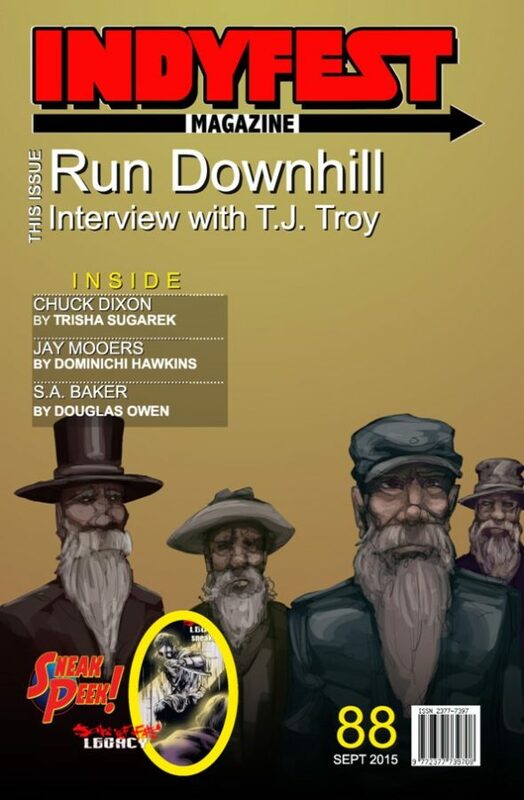 Articles: Doug Owen’s A Written View and Characters: Where are you by Trisha Sugarek. Work this issue done by Ian Shires, Ellen Fleischer, Everard McBain, Douglas Owen, Raphael Moran, Dominichi Hawkins, Trisha Sugarek, and Jeff Nelson. 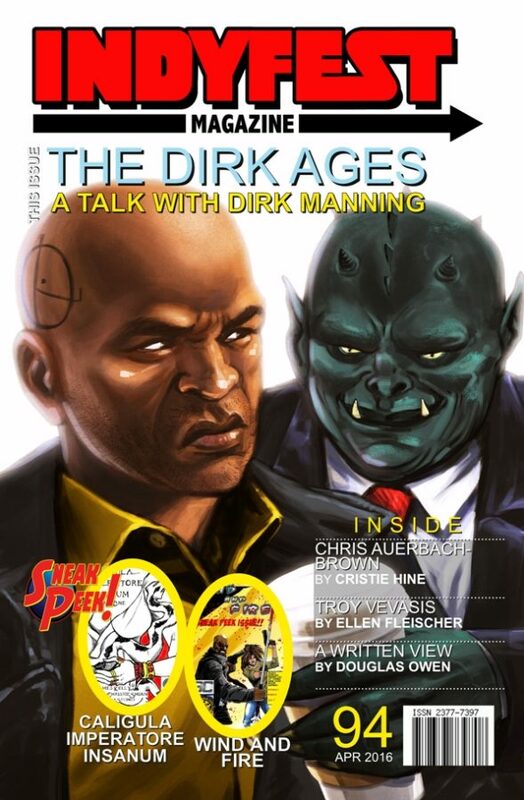 Cover art by: Jerry Voigt, additional artwork in issue by Diana Busby, Joshua Wemer, Rich Perrotta, Sean Seal and Thad Stalmack II. 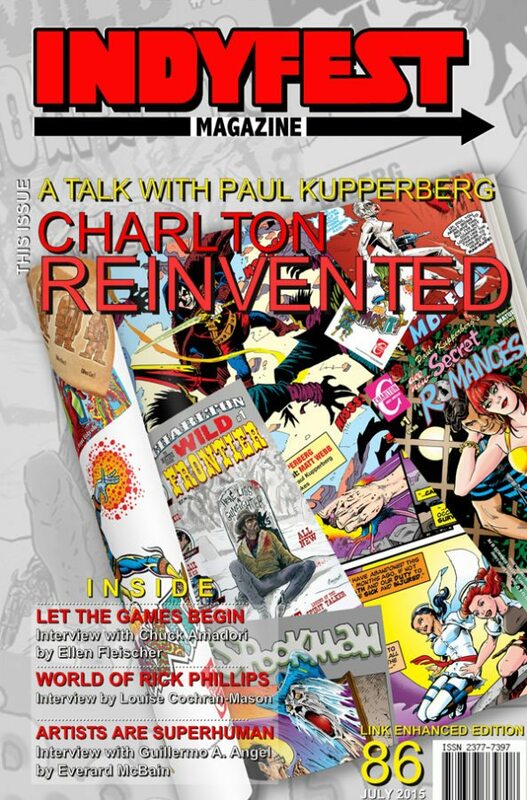 In the July issue: Cover story interview with Charlton Comics – Paul Kupperberg! Plus: Chuck Amadori – with a Sneak Peek of Tether #2, Rick Phillips, Guillermo Angel, Stan Yan, and Roger Keel. Articles: Doug Owen’s A Written View and Trisha Sugarek’s A Writer’s Iceburg. 48 page Full Color PDF with Links! Work this issue done by Ian Shires, Ellen Fleischer, Everard McBain, Douglas Owen, and Steven Pennella. 40 page Full Color PDF with Links! Work this issue done by Ian Shires, Ellen Fleischer, Everard McBain, Douglas Owen, Steven Pennella, Nichi Scribbles, Gabriel Ramirez, Raphael Moran, Louise Cochran-Mason, and Mark Turner. 52 page Full color PDF with Links! In the April issue: Cover story interview with Dan Bodensein! 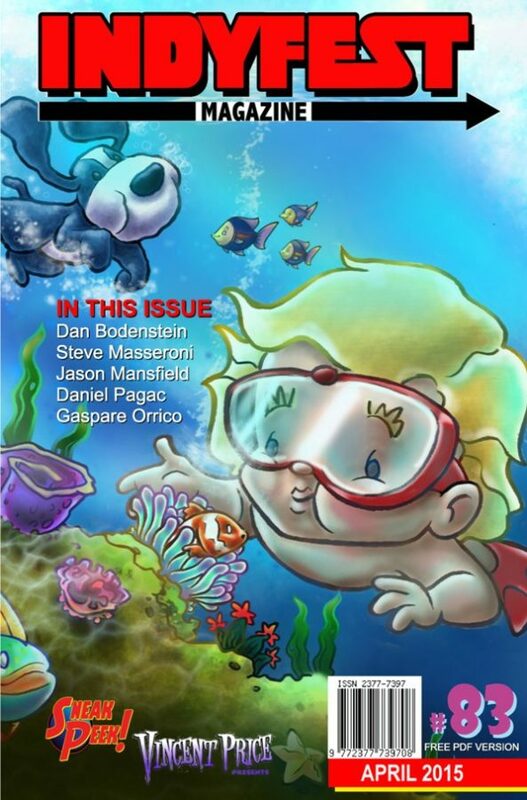 Interviews with: Steve Masseroni, Jason Mansfield, Daniel Pagac, and Gaspare Orrico. Sneak Peek of Stan Yan’s Vincent Price Presents. Article: Douglas Owen’s A Written View, on Submitting. Work this issue done by Ian Shires, Ellen Fleischer, Douglas Owen, Steven Pennella, Everard McBain, Nichi Scribbles, and Gabriel Ramirez. Full color PDF with Links! Article: Douglas Owen’s A Written View, basics of editing. Work this issue done by Ian Shires, Ellen Fleischer, Jay Savage, Douglas Owen, Louise Cochran-Mason, Mark Turner and Steven Pennella.